Always update. You know that by now. You can now check the range FROM: asteroids, debris, gas clouds, remotes TO: ships (CTRL-SHIFT-S) or everything (again, asteroids, debris, gas clouds, remotes) (CTRL-SHIFT-L). There are no lines to show you the results (way too difficult geometry problem), only a text report. This is another usage of this technology. Is the asteroid being blown away by a seismic charge close enough to this Z-95? Hit CTRL-SHIFT-L while the asteroid is selected and you’ll know from the text report. and now: You can also adjust the charge and the force charge, but the popup won’t dismiss itself right away; you can spam those buttons. The other buttons do dismiss the GUI. TO DO (next module version): The same overlap event should also trigger a mouse GUI that lets you select the front or back of the ship that passed through in order to attach it automatically, translated and rotated right. The 2 choices will offer a silhouette of the token and a clickable white or red dot, depending on space availability. Free Rotate is back for all asteroids, debris, gas clouds, remotes. I can’t keep the keyboard-driven rotations on top of this without screwing up overlap detection. Sorry! Multiple chat log reports when a dial is revealed. What was happening: the players and observers with 8.5.0 would do an “echo message” when the dial reveal command was sent to all observers. This is hopefully a thing of the past now. Only player 1 could fully complete a mouse GUI-launched ship reposition without a java null crash. All non-p1 players would instead get the crash and not be able to click on the pieces on the map without first relaunching vassal. The workaround was to ask p1 to do all these repositionings. It is now fixed and everyone can do it without issue now. Has started a few design mockups for the mouse interface and WOW, I can’t wait to implement it. Not this module version though… I think everyone will be happy when it comes. Once the mouse GUI is more advanced and running more smoothly, I’ll slow down on the new features and finally return to being a player. As a matter of fact, I’ll partially do that right away because I’m feeling the beginnings of a burn out on vassal development. No one wants that. 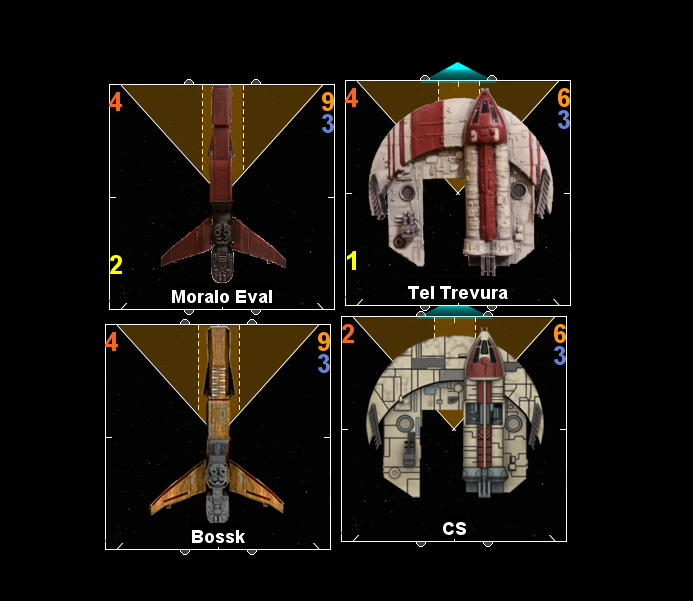 The ship, pilot and upgrade data have been slowly added to the xwing-data2 project led by Guido Kessels and his army of contributors over the past months. You could already spawn placeholder objects with varying levels of graphics (depending on how fast I was to add them in the web-based content checker). But now, you can peruse them all. Let me know in the Issues Page linked above if I missed anything. Take note that the Cargo Debris has also been added to the list (instead of the old 1st edition CTRL-SHIFT-ALT-C shortcut, you can simply get it from the bomb spawner with CTRL-G). Even the Spare Parts Token can be dropped with this, but it’ll only make sense if you keep the forward 1 template for the bomb spawner. I plan to do some level of automation for these remotes for the next module version. See the patch notes below, they’re my TO DO entries. The Buzz swarm droid token will be roughly similar when it’s time to attach it to the front or back of a victim ship; the spare parts canister is much easier – you only need to spawn it from the bomb spawner and then won’t have to move it for the rest of the game. When you select a reposition button (for now, barrel roll with straight 1, 2 and bank 1), you’ll get a second stage of the mouse interface showing you visually which positions are legal only to you, the activator of the mouse GUI. However, since you can’t freely go around and check every reposition with impunity (not allowed under the game rules), a chat message will tell you which reposition is being checked out and how many legal positions (unobstructed) are possible, which could bind you into commiting to one of them. This is still a beta mouse interface: this means the size will be adjusted, the graphics will be improved and a TON MORE functionality will be added. 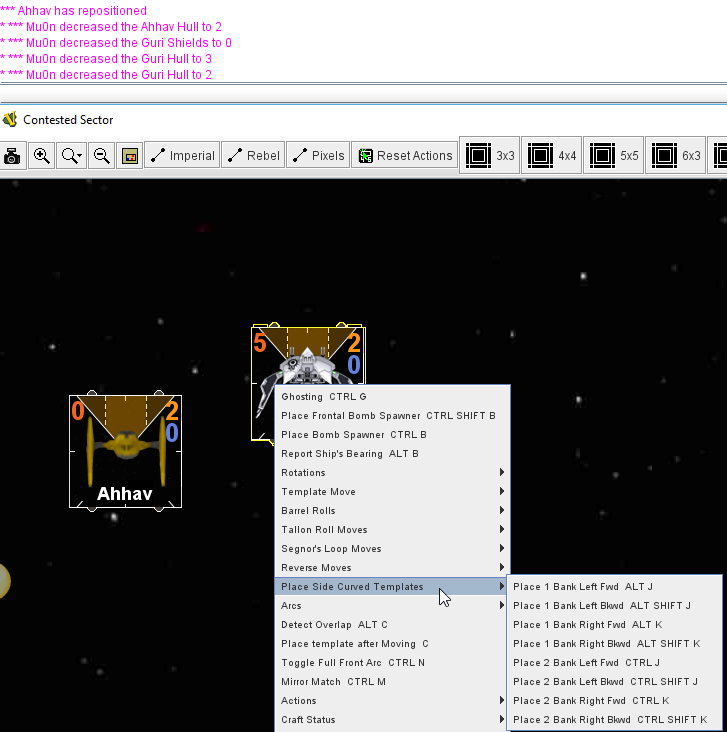 The popup will adjust itself in an empty area instead of being at a fixed offset to the right of the ctrl-clicked ship. I regularly get offers for help with the module. In the code department, it’s a nightmare to set up because of the vassal engine which has a huge learning curve, which is itself completely shadowed by our mixture of amateur (me) and professional (some helpers since 2017) code; it’s a serious chore getting even professionals up to speed with this. But graphic work? I know there are a lot of talented designers out there who could land a hand and make this happen more than 10 times faster than I could, at a quality that I can’t reach. Autospawn can now spawn them. Their xws names are gascloud1, gascloud2, gascloud3. 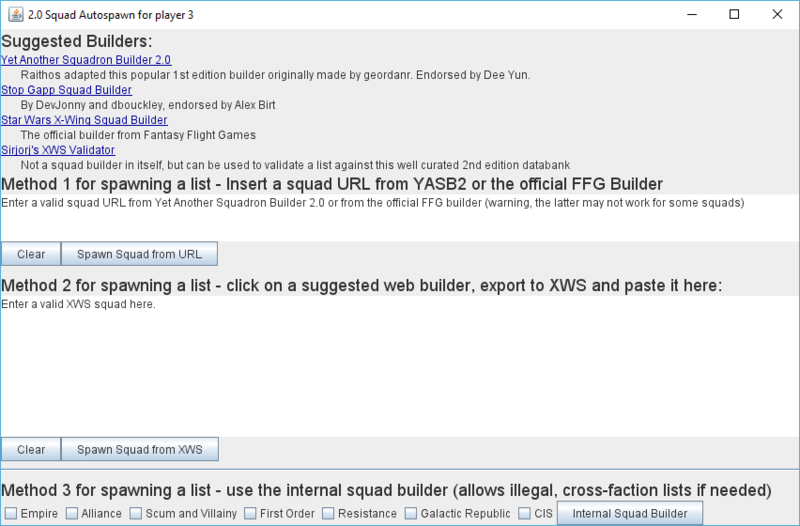 YASB2 has been updated to support them as well as provide a correct link for Vassal’s autospawn. An autorange firing line (or band of lines between parallel ships lined up right) passing through a cloud will be marked as obstructed. All asteroids, debris, cargo debris and gas clouds can now be nudged and rotated using the same commands you could with templates and ships. Shift-Arrows to translate. 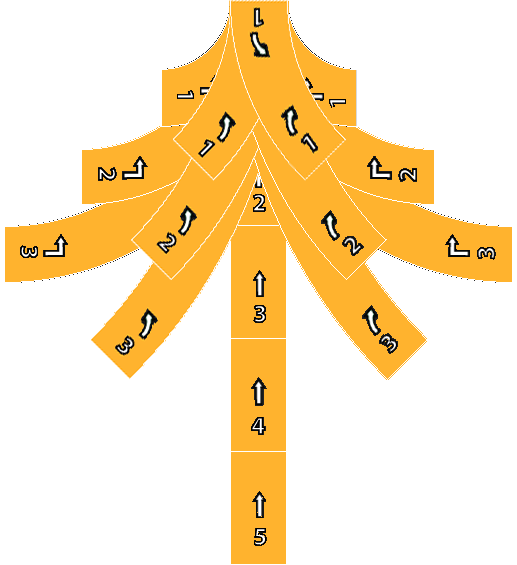 Left & Right arrows for 15 degrees rotations. 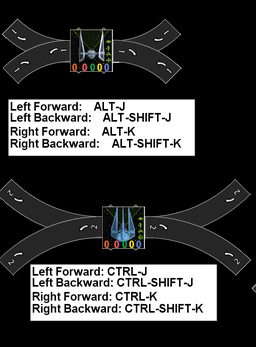 Ctrl-Left & Right Arrows for 1 degree rotations. Rotated mines, asteroids, debris and gas clouds (using the nudges mentioned in the last items) will now properly trigger collisions with their slightly rotated angles. I had to remove the free rotation that was manipulated with the mouse in order to make all of this work (the one initiated with CTRL-R and then chosen with a movement of the mouse and which was ended with a click) – sorry! The ship base graphics are now much more similar to their real life counterparts: instead of having a normal colored front arc for all ships, only the ones that actually are supposed to have one do now. No colored arc ships are present (ie YT-1300), full front arc ones are present (ie YV-666) and front & rear arc ones are present (ie FS-31). On top of this, the rear arc lines are much more visible and full. Autorange lines will now turn off during a playback of a logfile instead of accumulate and pollute the map. Helped on 3 occasions to bring critical ideas which led to finalize the eradication of 3 bugs. Helped find a solution to the upgrades not being processed for the content management tool he wrote – this helped bring all the new upgrades to the Content Checker repository. If you care about using the Escrow Squad feature which was announced with v8.4.0, then yes, do update. In v8.4.0, it only really works with the player that clicks on the last button of the Escrow process. The other players receive broken dials they can’t interact with. If both of these features aren’t interesting to you OR your opponents never bug you to use Escrow, you can wait until the next module version. Squad points are shown when the info is available from a squad spawned using a URL, or a direct XWS json paste. They aren’t calculated nor shown from a squad originating from the internal squad builder though. A ship moved from a dial ‘Super-Reveal’ (Ctrl-S) that overlaps a ship is now ready to accept the ‘C’ key (overlap resolution) right away – no need to click on the ship first. The selected dial you just interacted with can pass that command through. v8.4.0 mentioned it would provide that feature but this fix was lost in the shuffle. It’s now back with this v8.4.1. Ctrl-Left click on a ship to see a crude beginning of a ship popup. You can’t do much yet with it, but have fun trying out the various barrel rolls and stats alterations in there. (Dial) If you reveal a move with CTRL-S and your ship bumps, you can type ‘c’ right away to resolve the collision instead of having to click select the ship and do so. Step 6: the last player to click on ‘Set’ in the ‘Escrow Squads’ window will see the ‘Spawn’ button (in the same window) as clickable – once clicked, that button will spawn all the readied lists in each player’s windows. When someone reveals a dial on the map, the message no longer uses *your* name in the sentence which was weird when you weren’t the owner of the dial, or just a mere non-player observer. Super-revealing makes a ship move – but what if the ship bumps on another ship? Vassal players expect to press ‘c’ to resolve the bump right away, as they are instructed to do so thanks to a chat window message. However, with this new way of moving ships, the dial is selected, not the ship. Therefore, ‘c’ wouldn’t work unless you manually left clicked the ship first. Therefore, you can now also instruct the ship to resolve its bump via its associated dial by pressing ‘c’. The command will now reach the ship despite the latter not being selected. A dial whose orientation was tampered with (using left arrow or right arrow) would not refresh its selected move properly. This is now fixed. The launch time of the module reduced from several minutes to a few seconds; the content self-check is much smarter now. Player Tsukuda_Joe (and a few others) reported that the module was taking a long time to load whenever you launched it. This was for every launch, not just for the first time you open your module after a fresh download and you get this image tiling process for every art asset in the module. It got as bad as taking a full five minutes on some occasions. This has been completely been brought down to mere seconds this time around. Arguably, this is the most complex change brought to the module for this release. If you’re curious, read the rest of this section. If you’re merely happy about it and want to read the other features, feel free to skip to the next section. Why it happened: Upon loading, the module went into a forced integrity self-check for its art assets. 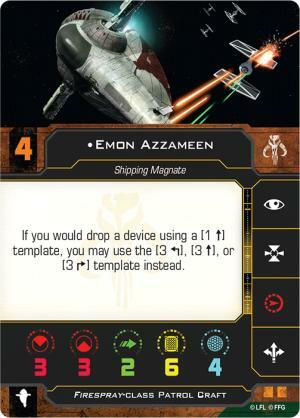 It would look at both the community’s xwing-data2 repository, figure out the official list of ships, pilots and upgrades and check if the module carried every single card graphic + ship base graphic + dial graphic, etc. It would also in parallel look at another depot (which I personally manage) to find out about 2-state ship graphics (such as the T-65 X-wing, U-Wing, etc.) and check for the presence of those files as well inside the module. It would stop at the first occurence of a missing item, and then let the user know something was missing through flashing the ‘Content Checker’ button in the main window. Upon downloading those new things on the fly and adding them to the module, the alert that something new was available would then stop. Therefore, a player was punished (timewise) for having everything inside the module already, since it would let the self-check run through the whole list, inducing hundreds of web requests, which can quickly become problematic in some parts of the world. How was this fixed: Instead of checking every item that needs to exist in the module, it only checks the version number of the xwing-data2 repository and compares it to a local file in the module and knows when to flash the content checker button to indicate that something new must be acquired. The same goes for the over-the-air repository that I manage. Warning: for the time being, the first launch of this module version will nervously ask everyone to go through the content checker and verify if something new is available. It’s anyhow probably a good idea these days since at the time of writing this, we’re at the end of November 2018 and about to receive wave 2 of the 2nd edition with tons of new cards and many more playable ships for 2 separate factions. After this initial checkup is done, it will only bother you when there’s actual new content to get (touch on wood). This addition is pretty straightforward, who knows if it’ll catch on and be massively adopted by players, old or new. You can find it in the player windows. add reported text for when hull, shield, force and charge are changed on a ship. Concerns about even more slowdowns here. The Pieces window no longer carries 1.0 ships. Those pieces were not used directly by the 1.0 Squad Spawn anyway, they were deprecated relics. Clicking on another player’s ‘2.0 Spawn’ button will no longer cause a delay (related to fetching the remote data) before telling you you can’t spawn for another player. Dial Mask images are back. A new type of dial will arrive in the module at some point, but for now, old school dials will be used. When hidden, the dials (for most ships) will no longer disappear and only display the dial text tag. This is just a quick, hackjob patch and wave 2-3 ships won’t have proper dials if we ever get to being able to play with them without the next dial type in place. Charge tokens no longer spawn in stacks of n tokens deep, where n = up to the number of pilots used in your squad. Squad Spawn 2.0 didn’t know what to do with a hardpoint upgrade (it only specifies one of three upgrade slots that’s made available on the ship but isn’t an upgrade itself) since it expected cards of that new type. This is now ignored by the module while it fetches the pieces for your list. The bank barrel rolls are now visible right click menu options (they worked nevertheless in the last 8.2.0 version, but they just weren’t visible). Both Loose Stabilizer critical cards used the Hull Breach art instead. This has been rectified. Autorange bug uncovered by evcameron: front or back autorange could sometimes miss a better shortest line depending on a specific combination of attacker and defender size. The problem was the criterium which was used to determine the “closest attacker arc edges” and the “closest defender corners”. More lines were added to the pool of lines up for consideration and the function which calculates the best (shortest) distance now picks the correct choice. Made a standalone tool for adjusting the file images used for pilots and upgrades and destined for the over-the-air content auto-updater; this tool also detects missing files, mismatched entries between the community’s xwing-data2 data repo (managed by Guido Kessels), the module and the over-the-air repo, etc. Really useful for adding new content to the module and making the auto-updater shine even more than ever as well as reduce the stress of making mistakes while processing new content. Helped locate the bug about missing the pilot tag on the target lock tokens. This module is hundreds of hours from yours truly spread out over the months since May 1st. A lot of code from past collaborators had to be adapted, forked and in some cases, bug-fixed in order to make 2.0 a reality in Vassal. Mike Murphy’s content checker and autospawn revisions in early 2018 were key to making this possible. 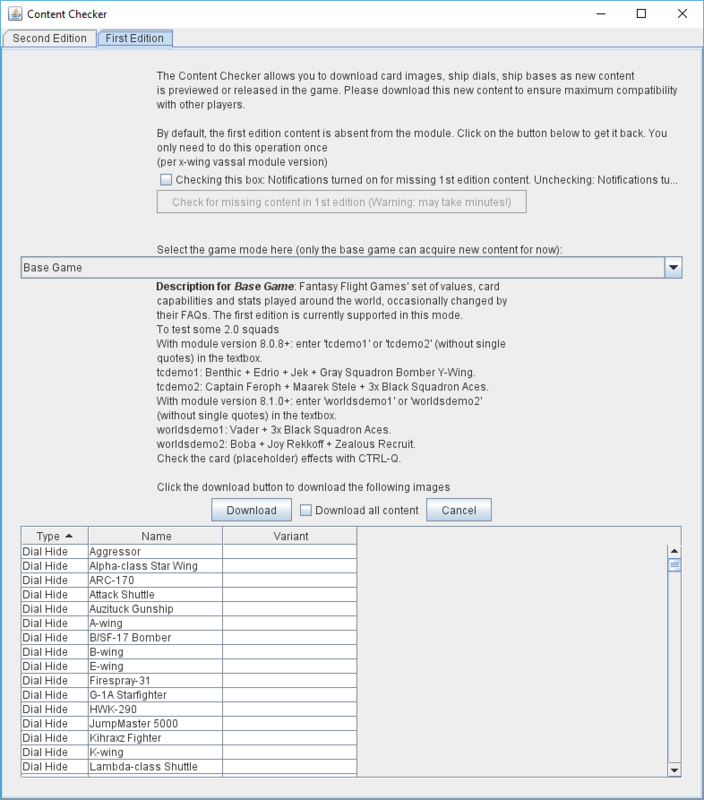 The content checker is an oddity for most players, since it was only briefly used around the time of wave 14’s release, near the end of the Vassal League season 6. However, everyone will eventually see how it will play a key role in bringing the new 2nd edition content as it trickles in from previews and market releases. Thank you to my patreon supporters who have stood by me and made this sting a whole lot less. The pledges are now on a monthly basis, ranging from $1 to $10 and I buy prizes for raffles. So far, 10 ship packs have been awarded, 7 bought and paid for, 3 pending on the winner’s decision. If you want to support the module, here’s the link again. Before the launch of this v8.2.0 module, I got a lot of useful feedback from many players and users of the module inside the Vassal league slack. Thanks to the 50+ people who were active and supportive in my #vassal2e_alpha channel. It really helped me push this out a day before the IRL release of 2.0! Yay! We beat them to the race! 1. There’s a different Squad spawning button for 2.0 lists called ‘2.0 Spawn’ inside the player windows. Use this instead of the old ‘Squad Spawn’ button (which I should rename to ‘1.0 Spawn’ to avoid confusion). The suggested builder list is dynamic and polled from the web! Contact me if you know of a new squad builder which supports export to XWS! 3. I added another way by making my own internal squad builder (more info below) where you can select your stuff, export to XWS in a textbox, then spawn your list. 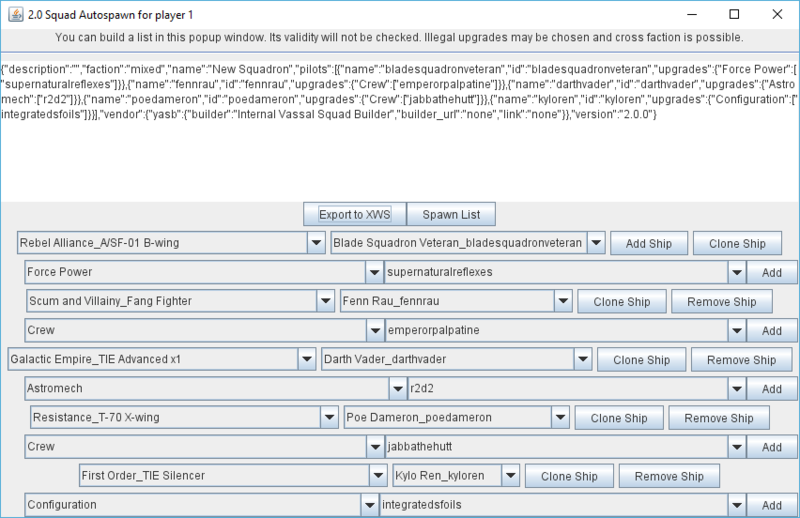 It can create an illegal, cross-faction list that doesn’t care about upgrade slots for any ship – this is great for very custom scenarios, whereas squad builders try to force you to have legal lists. 4. When in doubt, the right click menus are still king. They’ve been significantly improved since last edition. 5. If the ‘Content Checker’ flashes black, then DO CLICK ON IT and go add the content. It will only take a minute or so and it will give you some missing image files. When you spawn a list, you’ll no longer use placeholder images and other players who are checking out your list in your window will no longer see placeholder images either. Everyone should get all the content ASAP to make it better for all. What happened to the 1.0 content? The Pieces window is no longer used to manually spawn your list. The autospawn is where it’s at (and has been since early 2017). While the 1.0 ship-related content inside its tabs relatively looks ok, it’s static by nature and can become deprecated – it will all be phased out soon and I will simply keep tabs for tokens, asteroids, missions, templates for when you need those things in a jiffy. Better is to just use the ‘Squad Spawn’ button to fetch all your pieces like has been done by all players. My main collaborator Mike Murphy has done an awesome job of tying the autospawn to the xwing-data community repo (think database) in early 2018 – it might not sound all-important but it was VITAL to convincing me that adding 2.0 support to the module was even feasible. This cut down on almost half the size of the module file and makes the infamous ‘image tiling’ process much faster when you load the module for the first time after a fresh download. I anticipated that the 2.0 content would add hundreds of new files, so having both editions’ worth of images inside the module would make the wait period much longer upon your first loading. I also anticipate a lot more players will be only interested in 2.0 going forward, but it really matters to me to keep 1.0 functional inside the module. I’ve created a simple way to censor all the cards within seconds without requiring anyone to download a new module, without requiring to download new content via the content checker or anything involved of the sort. It takes between a few seconds to a minute to activate and I call it my own brand of ‘Order 66’. 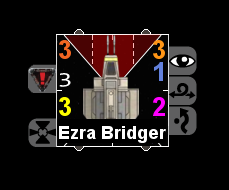 It will make all pilot, upgrade and condition cards appear as black rectangles with white outlines and white card title text. If I ever get a copyright infringement warning email either directly or through vassal’s admins, I can activate what is essentially a killswitch for all those art assets. 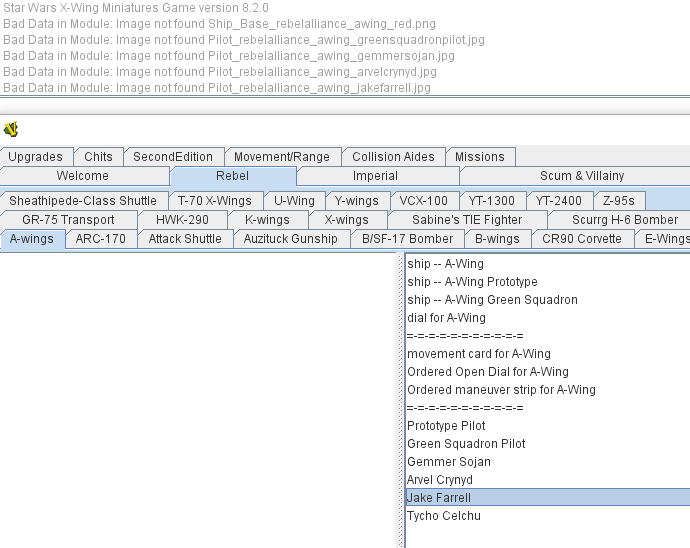 The X-Wing Vassal module has always been and will keep on being free to use. The official FFG squad builder offers everyone all the cards now at the same resolution we get them from their preview articles. If the owners of this copyrighted materials (not me) would wish to protect their IP, I would understand and would offer to censor the cards back by flicking the ‘Order 66’ switch. Over the years, this has been a hotly debated issue and many different people have weighed in but it seems I can never get ahold of a real (as opposed to armchair) specialized laywer in IP laws. If you are such a person, then please contact me with a PM. If you need a quick way to build a list, know your composition by heart and don’t need to check its validity, want to build cross-faction lists or have a totally open format, then the internal squad builder is for you. This is a 2nd method found in the window that appears after you click on ‘2.0 Spawn’ in a player window. You can even find unreleased factions in there. 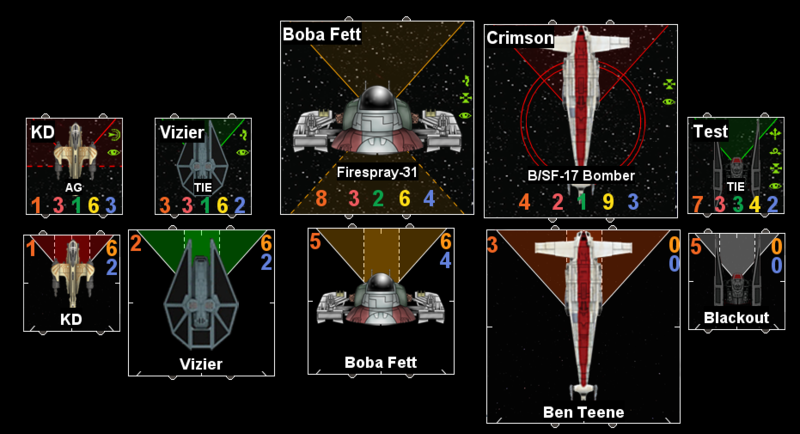 The ships and pilots are dynamically fetched from the community repo of xwing-data2, led by the one and only Guido Kessels. 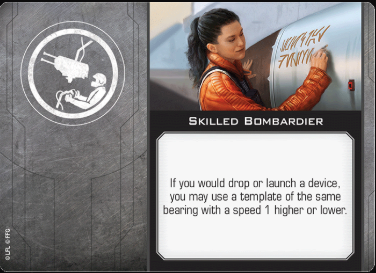 To operate this builder, use the pull-down menus and buttons to add your pilots and upgrades. When you’re ready, click on ‘Export to XWS’, which will create a valid XWS json string inside your textbox. The final step is to click on ‘Spawn Squad’, which spawns the list from the texbox content (and not from the pulldown menus). A Very Illegal List. 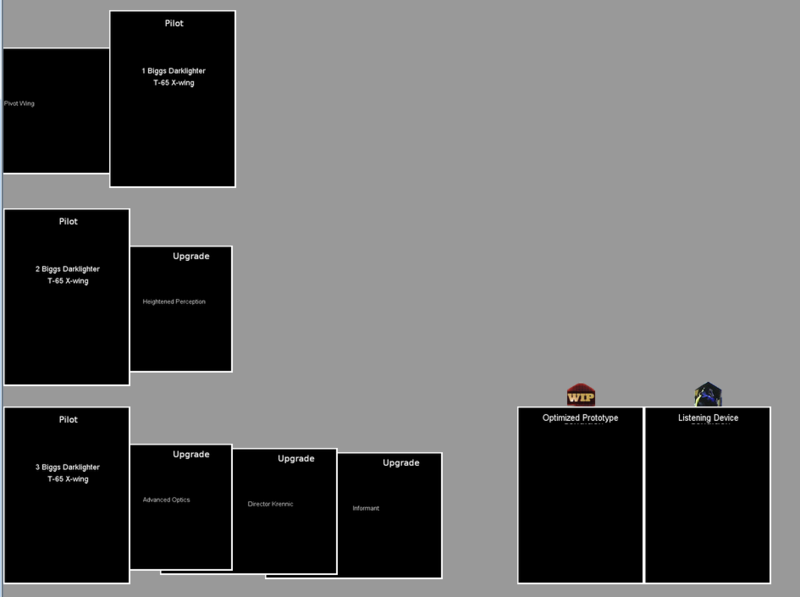 The interface is crude but serviceable, much like Vassal’s general style! 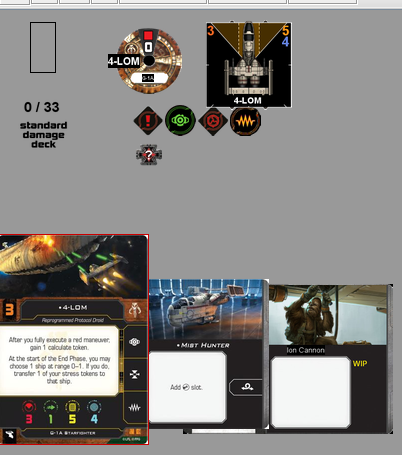 I wanted to make the bases less cluttered so I removed the attack and agility stats, which can be seen from the pilots cards anyway. Attacks have become more complicated and can’t be represented by only 1 number anymore (such as the new Lancer-class Pursuit craft, which has a front arc of 3 and a single turret of 2). The ship name tag has been removed and only the pilot name tag is present, at the bottom. At 100% zoom level, you should see the hash marks all around. The old way of spawning the relevant tokens with your autospawned list was to hard code which action, pilot, upgrade or ship brought which type of token. Every other module update, some people would complain that their favorite ship composition was missing a token and if I remembered, I’d add it to a source code file inside the module. This has been replaced by something a lot more agile – I have a file somewhere on the web which contains these associations. Within seconds, it can be edited with new additions, and everyone with the module 8.2.0+ can spawn those tokens right away, without needing a new module update. You found a token which should (but does not) spawn with such-and-such pilot or upgrade? Then let me know (I’m reachable in the Vassal league slack, check the links at the top to get there) and I can quickly add it. A lot of shortcuts had to be learned from the guide website or from my preview articles – but this becomes completely lost information for new players not aware of the guide. Since I had to rework the ships from the ground up in the vassal editor, I also strived to make the shortcuts more present and universal. I’m still missing a few (they’ll be added in the next version) but you should no longer have to guess how to do a Tallon Roll speed 2. 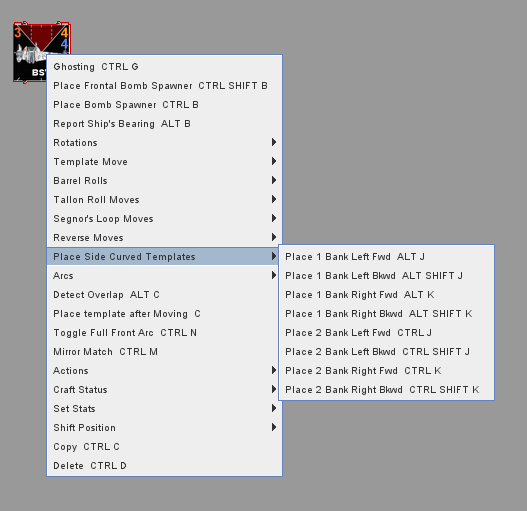 This specific submenu ‘Place Side Curved Templates’ will make it into the next module version – sorry! You can still use those shortcuts anyway in v8.2.0 even if you don’t see them in the menu. The module will respond to those commands. You could move the ship after a barrel roll/decloak into 2 positions per side: as forward as possible or as backward as possible. (for now) You can only spawn the weird side templates using the same shortcuts as before. I’ve gotten a lot of messages about needing help for StarViper’s brand of barrel rolls. This information is both in the website guide and the How To & Shortcuts button inside the module, section on Weird Ships. Here’s a recap. I had to rework the Bomb Spawner and just add all remaining moves not already present: forward 4, hard turn 2 left and right. There already was an easy way to add alt-paint jobs inside the module, but I made it so it’s even easier and tied to the Content Checker. If you are willing to add a ship and are SERIOUS about it, then you must provide an enough high quality image that will fit inside a transparent background .png file of the SAME SIZE as the ones that are used in the module for ship standalone graphics. I can provide you with an example for small, medium or large, then you give me your finished product back. Be mindful of resizing that can affect the level of details. I reserve the right to stop doing this if I get flooded with requests and to turn down images that don’t respect the above conditions. I love a good alt paint job like everyone else, but I do not need a ton of extra work of doing some hand holding to make your images work. In my speedy removal of 1.0 content graphics, I removed the back dial images as well. Having a dial in hidden mode will appear invisible, but you’ll still see the text markings on it (and the mirror match do if you use it with CTRL-M). I’ll provide an entirely new style of dial in the next version or so of the module. Autorange firing options for single turrets and double turrets don’t work yet – all we have is the lancer-class style check (ALT-SHIFT-F), which uses both the mobile turret (now single turret) and the front arc – we need something that *only* checks the single turret arc. We need something totally new that checks the double turret arcs.